Nivolumab (Opdivo), a PD-1 checkpoint inhibitor that helps the immune system fight cancer, was associated with a decrease in tumour size or disease stabilisation in people with hepatocellular carcinoma (HCC) in the CheckMate 040 study, according to a report at the 2017 AASLD Liver Meeting last month in Washington, DC. Over years or decades, chronic hepatitis B or C virus (HBV or HCV) infection, heavy alcohol use, fatty liver or other causes of liver damage can lead to cirrhosis and HCC, a type of primary liver cancer. People with hepatitis C who have progressed to cirrhosis remain at risk for liver cancer even after being cured with effective antiviral therapy. HCC is often diagnosed late, when it is difficult to treat, and it is a leading cause of cancer-related death worldwide. The kinase inhibitor sorafenib (Nexavar) is the only approved first-line therapy for HCC that cannot be surgically removed, but it typically extends survival by only a few months. The US Food and Drug Administration recently approved nivolumab for second-line therapy after sorafenib. Nivolumab is currently approved in Europe for advanced lung, kidney, bladder and head and neck cancers and Hodgkin lymphoma, but not yet for liver cancer. Nivolumab is a monoclonal antibody that blocks the PD-1 (programmed death) receptor on T-cells. PD-1 regulates immune response by suppressing excessive immune activation. Some tumours can use PD-1 to turn off immune responses, and drugs that block PD-1 or its ligand PD-L1 can restore T-cell activity against cancer cells. CheckMate 040 included a phase 1 dose escalation cohort in which 48 participants received intravenous infusions of nivolumab at doses of 0.1 to 10.0 mg/kg every two weeks. After the 3.0 mg/kg dose was selected, 214 more people were enrolled in a phase 2 dose expansion cohort. There was no placebo or comparator drug arm. In the dose escalation and expansion cohorts together, about 80% of participants were men, half were white, 45% were Asian and the median age was 63 years. A quarter had hepatitis B (and had to be on suppressive antiviral therapy), another quarter had hepatitis C and half were not infected with either virus. Participants had biopsy-confirmed advanced HCC not amenable to curative surgery. More than 70 per cent had metastases, or cancer spread beyond the liver. About two-thirds had previously used sorafenib, and most of those had disease progression while taking it. The remainder were intolerant of or unwilling to take sorafenib. The primary study endpoints were safety and objective response, meaning either complete or partial tumour shrinkage. Secondary endpoints included disease control (meaning either tumour shrinkage or stable disease), time to response, duration of response and overall survival. The objective response rates were 20% for people who had never used sorafenib and 19% and 14%, respectively, for sorafenib-experienced people in the dose escalation and expansion cohorts. Among people who could not take sorafenib due to intolerance, the objective response rate was 23%, compared with 15% among those who progressed while on sorafenib. Complete tumour regression was uncommon in all groups (1 to 3%). Stable disease rates were 31% in the sorafenib-naive group and 32% and 41%, respectively, in the two sorafenib-experienced groups. Combining objective response and stable disease rates, 54% of people who had never used sorafenib and 55% of those who had done so did not experience disease progression. The median overall survival was 15.0 and 15.6 months in the two sorafenib-experienced groups. In comparison, people who switched from sorafenib to a recently approved similar drug, regorafenib (Stivarga), had a median survival of about 11 months. The median survival for the sorafenib-naive group could not be determined because a majority of people were still alive, but this was projected to be 28.6 months. 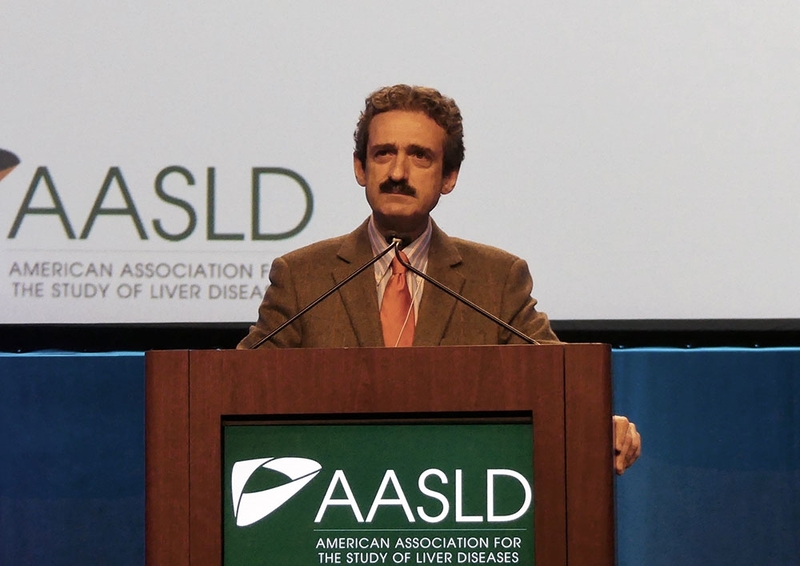 Sangro noted that nearly 40% of participants with hepatitis C had at least a 1 log10 drop in HCV RNA after starting nivolumab, and one person was cured without taking hepatitis C therapy. Nivolumab had no consistent effect on HBV levels. Treatment with nivolumab was generally safe and well tolerated, with no unexpected side-effects not seen in other trials. The most common treatment-related adverse events were fatigue, itching, rash and diarrhoea, which were mostly mild or moderate and occurred with similar frequency in the sorafenib-naive and -experienced groups. The biggest concern with PD-1 inhibitors is that they may unleash the immune system too broadly, leading to excessive inflammation of healthy tissue. Some study participants developed liver enzyme elevations suggestive of liver inflammation (which the researchers said were easily managed) and one person died due to lung inflammation (pneumonitis). Sangro B et al. Nivolumab in sorafenib-naive and -experienced patients with advanced hepatocellular carcinoma (HCC): survival, hepatic safety, and biomarker assessments in CheckMate 040. The Liver Meeting, abstract 141, 2017.